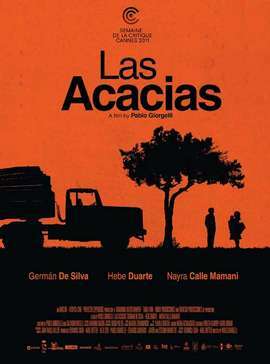 LAS ACACIAS is at once a simple and complex movie. Technically, it's nothing special. The story is so simple as to be accused of being simple-minded. Two people fall in love. That is all. And that is everything. The movie opens with Ruben (German de Silva) going about his business as a truck driver hauling logs from Paraguay to Buenos Aires. His boss has compelled him to give Jacinta (Hebe Duarte) and her baby girl Aniha (Nayre Calle Mamani) a lift. At first he barely opens the door for them - they travel a day before he asks their names. And yet, as we come closer to Buenos Aires the tension and emotions build. The three travellers have barely spoken - barely left the confines of the truck - a baby's laugh counts as a major plot point - and yet, and yet, there is an understanding, a longing. Will Ruben ask to see Jacinta again? Such is the subtlety and power of this film - coming at under 90 minutes, the first 30 of which are a test of patience - that it is quite shocking when you realise just how fascinated you are with the couple and how tense at the ending. Kudos to the young Argentinian director Pablo Giorgelli and to his fellow writer Salvador Roselli but most of all to the cast. In particular, veteran theatre actor German de Silva is superb - his final scene, wordless, expressing complete emotional exhaustion, vulnerability - is captivating. This is without doubt one of the most unassuming and yet most deeply affecting and memorable films of the year. LAS ACACIAS played Cannes 2011 where it won the ACID Award and the Camera D'Or for best first feature. It also played Toronto and London 2011. It will be released in the UK on November 4th and in France on January 4th 2012.